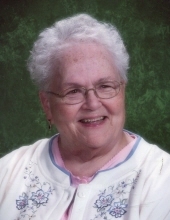 Mary Joan Emerine, 88, of Fostoria, passed away at 1:20 am Wednesday January 30, 2019 at Independence House, Fostoria. She was born May 27, 1930 in Tiffin to the late Francis E. and Eleanor P. (White) Bragg. She married James V. Emerine September 2, 1950 at St. Wendelin Catholic Church, Fostoria and he preceded her in death on September 17, 2004. She has eight children; six sons, James R. Emerine (deceased 1964), Michael J. (Linda) Emerine, Fostoria, Joseph K. (Helen) Emerine, Fostoria, Mark L. (Karen) Emerine, Fostoria, Martin D. (Holly) Emerine, Coldwater, Matthew J. Emerine, Fostoria; two daughters, Joyce (John) Valachovic, Findlay and Amy (Harry) Peters Jr., Fostoria; twelve grandchildren, Bradley Emerine, Amanda Fox, Angie (Rob) Maley, Jon (Hannah Webster) Emerine, James Valachovic, Alexandra Valachovic, Shelby Emerine, Tara Emerine, Adrienne (Tyler Rumschlag) Emerine, Veronica (Richard) Bell, Olivia Milligan and Troy Milligan; eleven great- grandchildren, Leandra Emerine, Brennen Emerine, Xaviour Emerine, Addie Maley, Alex Maley, DeSean and Arianah McBeth, Nallie Valachovic, Charlotte, Nora and Lincoln Bell. She was preceded in death by a brother, Richard E. (Mary) Bragg; sister, Sister Joyce Bragg; and in-laws, Shirley Wright and Joanne (Jack) Holderman. Joan had worked in accounts receivable at Fostoria Community Hospital. She was a member of St. Wendelin Catholic Church and had been a den mother for Cub Scout Pack 450. Joan enjoyed playing cards, crafting, and her flower garden. She was described by her family as being strong, loving, caring, spunky, a matriarch, who dearly loved her family. Joan especially was proud to be a grandmother and great-grandmother. Visitation is Sunday February 3, 2019 from 2-4 & 6-8 pm at HOENING & SON FUNERAL HOME 133 W. Tiffin St., Fostoria. Mass of Christian Burial is 10:30 am Monday at St. Wendelin Catholic Church, Fostoria with Rev. Todd Dominique presiding. A Rosary will be prayed at 10 am at the church. Burial will follow in St. Wendelin Cemetery. A funeral luncheon and gathering will then take place in the Parish Hall. Memorials are suggested to St. Wendelin Church or Cystic Fibrosis Foundation. To send flowers or a remembrance gift to the family of Mary Joan Emerine, please visit our Tribute Store. "Email Address" would like to share the life celebration of Mary Joan Emerine. Click on the "link" to go to share a favorite memory or leave a condolence message for the family.